Cacomiaf Tyre App is tyre catalogue app. 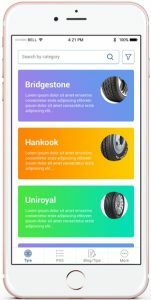 User can see tyres details, specifications, features etc. App also has company stores listing. so user can find the nearest store. Fugital Tech excels at custom design and front end development. We love taking on challenging projects that require full-on content strategy, thoughtful design, demanding development, and ongoing marketing. I consent to Fugital Tech collecting my details through this form.